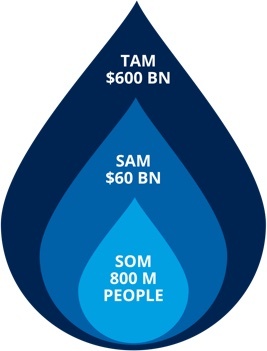 How do you calculate a market cap of a company that can affect the water supply for 800 million people? With fresh water, we grow our crops, cook our food and nourish our bodies. Without it, we can’t survive. Even as we explore space, the first question about any planet is whether there is a presence of water. In developed countries, many of us take water for granted. Turn on the tap, and there it is, ready to drink. Yet there are too many places where it’s not nearly so simple. Places where it takes hours to bring home a precious jug of water from a well, where water is contaminated and often the carrier of deadly diseases. At Rainmaker our purpose is to serve communities in need anywhere in the world, so that nobody thirsts for water. Innovation to create economic and social transformation. Michael O’Connor, CEO of Rainmaker delivers an inspiring speech on innovation at TEDxRotterdam. According to Michael O’Connor, water is the new gold. More and more people on this planet are deprived of their access to clean water, a necessity and therefore a human right. What better cause to get aspired for. Solving the world’s water crisis. Rainmaker builds two types of energy-efficient, fresh water-producing technologies to participate in this opportunity. 1. Air-to-Water, which harvests fresh water from humidity in the atmosphere. 2. Water-to-Water, which transforms seawater or polluted water into drinking water. 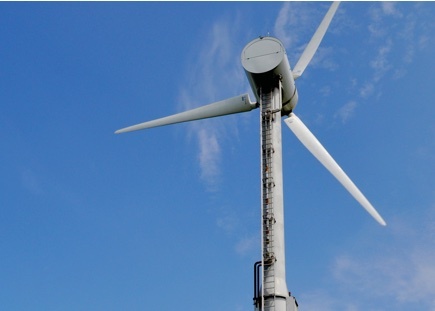 Our technology is both wind and solar powered, is deployable anywhere, and leaves no carbon. We also offer options for grid and diesel powered models. Rainmaker occupies the optimum and most flexible position when it comes to size, capacity and cost. The technology can easily and quickly be deployed where drinking water is needed most. Air-to-Water units are available in three sizes, producing 5,000, 10,000 or 20,000 liters of drinking water per day. Water-to-Water units are available in three sizes producing 37,500, 75,000 or 150,000 liters per day. This makes each unit suitable for communities of 200 to 30,000 people, depending on units deployed. 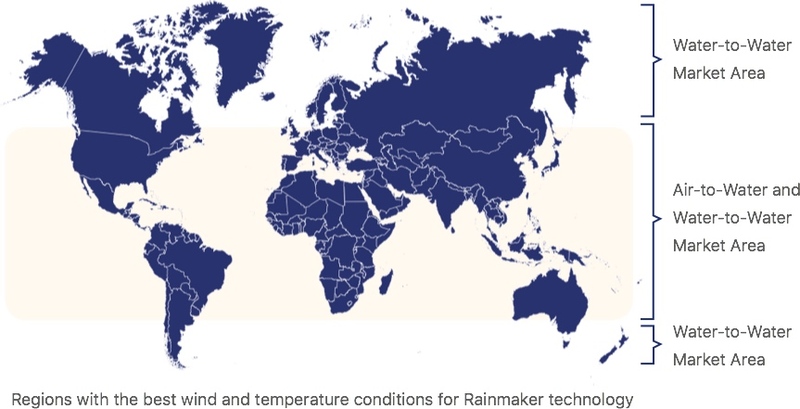 Rainmaker water is affordable — costing as little as 0.5¢ per liter, which is up to 100% less expensive than competitive technology production. Our goal is to become a global leader in solving the worldwide water crisis. Simply put, we’re creating safe, drinking water where little or none exists. Market size and opportunity: 800 million people. For the humanitarian market, we believe we are the best choice for communities of 200 to 30,000, with typical locations in the Middle East, North Africa, Southeast Asia, the Pacific, Mexico, Central America, and the Caribbean. There are also significant opportunities in heavy industry. Processing and refineries are looking for cost-effective solutions to clean up their waste water, rivers, lakes, harbors, and waterfronts. Competitors for Air-to-Water and Water-to-Water. Cost. Our patented technology means our cost per liter of water is lowest in the category. The Company began in 2008 as Dutch Rainmaker by inventor Piet Oosterling. It evolved through 2014, with units of the first-generation technology deployed in Kuwait and Northern Holland. To date, over $15 million has been invested in technology research, development and deployment. The second-generation units have improved energy efficiency by as much as 100%, significantly reducing the cost of each liter of water produced. The units are approximately 50% more energy efficient than those of our competitors. Rainmaker Worldwide Inc. was formed in Peterborough, Ontario, Canada in 2014 to consolidate all assets, intellectual property, and the executive management expertise of Dutch Rainmaker. Round 1 financing was completed December 2015. The first full year of operation was 2016. 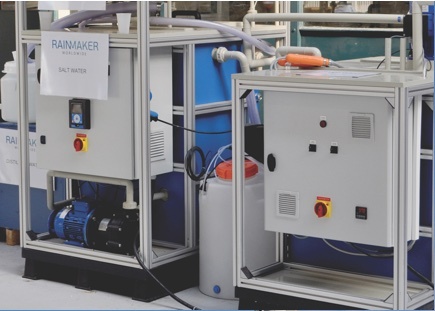 Rainmaker’s proven and patented technology is delivered in units that we believe are the right size for the majority of communities in need of water. Our units deliver from 5,000 to 150,000 liters of water per day per unit. Rainmaker technology is available either as a capital purchase, or on a Water-As-A-Service basis. This flexibility meets the needs of various governments, corporations and organizations. Rainmaker technology can be powered by wind, solar, grid, and diesel, or a combination thereof. This addresses the reality of the market, where water-poor regions often lack robust electrical grids. Much of this new growth will come in regions that are water poor, specifically African countries, India, Pakistan, Bangladesh, and Mexico. Furthermore, environmental damage due to climate change will help fuel ongoing growth. Precipitation has become less predictable, and regions that are water rich today, may soon need to generate water. Rainmaker is fully operational. Our overall sales pipeline has continuously increased with new projects and applications. In 2017, revenues are expected to reach $4.9 million, with a Compound Annual Growth Rate (CAGR), 2017 – 2021, of 120%. We have incorporated revenues from both product sales as well as water sales for projects where water is provided as a service. With new financing and the availability of project financing going forward, this balance could shift. Our management team is experienced in launching, managing, and operating high-growth companies. They have led numerous companies through successful IPOs. How do I invest in Rainmaker? Please familiarize yourself thoroughly with our forward-looking statements and disclaimers. This Business Plan has been prepared by Rainmaker Worldwide Inc. (“Rainmaker”). This business plan and any accompanying material (together the “Business Plan”) is being issued by Rainmaker to a limited number of parties to assist the recipients in deciding whether they wish to consider an investment in the Company. This Business Plan does not constitute an offer or invitation for the sale or purchase of securities. The information in this Business Plan, which does not purport to be comprehensive, has been provided by the Company and has not been independently verified. While this information has been prepared in good faith, no representation or warranty, express or implied, is or will be made and no responsibility or liability is or will be accepted by the Company, or by any of their respective officers, employees or agents in relation to the accuracy or completeness of this Business Plan or any other written or oral information made available to any interested party or its advisers and any such liability is expressly disclaimed. In particular, but without prejudice to the generality of the foregoing, no representation or warranty is given as to the achievement or reasonableness of any future projections, management estimates, prospects or returns contained in this Business Plan or in such other written or oral information. In this Business Plan there is reliance on and reference to information regarding the Company and the markets in which the Company intends to operate and compete. This information has been obtained from various third-party sources, including providers of industry data, discussions with contacts and the Company’s own estimates. Whilst the Company believes that industry publications, surveys and forecasts are reliable, they have not been independently verified, and no representation or warranty is made as to the accuracy or completeness of such information within this Business Plan. Additionally, industry publications, surveys and forecasts generally state that the information contained therein has been obtained from sources believed to be reliable, but that the accuracy and completeness of such information is not guaranteed and in some instances state that they do not assume liability for such information. The Company cannot assure you of the accuracy and completeness of such information as such information has not been independently verified. In addition, in many cases, statements in this Business Plan are made regarding the markets and intended position in the markets of the Company based solely on the Company’s experience, views, and its own investigation of market conditions. No assurance is given that any of these assumptions are accurate or correctly reflect what the Company’s position in the industry will be, and none of such internal surveys or information has been verified by any independent sources. No representation or warranty is made as to the accuracy or completeness of this information. Any prospective purchaser of shares in the Company shall be required to acknowledge in the sale and purchase agreement for shares in the Company that it has not relied on or been induced to enter into such an agreement by any representation or warranty, save as expressly set out in such agreement. This Business Plan has been delivered to interested parties for information only and on the express understanding that they shall use it only for the purpose set out above. The Company gives no undertaking to provide the recipient with access to any additional information or to update this Business Plan or any additional information, or to correct any inaccuracies in it which may become apparent, and it reserves the right, without giving reasons, at any time and in any respect, to amend or terminate the procedure for the sale of the Company’s shares or to terminate negotiations with any prospective purchaser. The issue of this Business Plan shall not be deemed to be any form of commitment on the part of the Company to proceed with any transaction. The information contained in this Business Plan is confidential and the property of the Company, which reserves the right to require the return of the Business Plan (together with any copies or extracts thereof) at any time. By acceptance hereof, you agree that neither you nor any of your agents, representatives, directors or employees will copy, reproduce or distribute to others this Business Plan, in whole or in part, at any time without the prior written consent of the Company and this Business Plan and any further confidential information made available to you will be held in complete confidence. Any recipient of this Business Plan in jurisdictions outside the US should inform themselves about and observe any applicable legal requirements. This Business Plan does not constitute an offer to sell or an invitation to purchase securities in the Company in any jurisdiction. Prospective investors should not view the contents of this Business Plan as legal, tax or investment advice. Each investor, and in particular investors without professional experience of investing in public companies, should consult his or her own lawyer, accountant or financial advisor as to legal, tax and related matters concerning an investment in the Company. This Business Plan shall not exclude any liability for, or remedy in respect of, fraudulent misrepresentation. By accepting this Business Plan, the recipient agrees to be bound by the foregoing limitations.